Package #1 – Our most popular package since 2009! Thousands of events in 6 states have made millions of dollars with this package. We do everything. All you need to do is get golfers and sponsors! 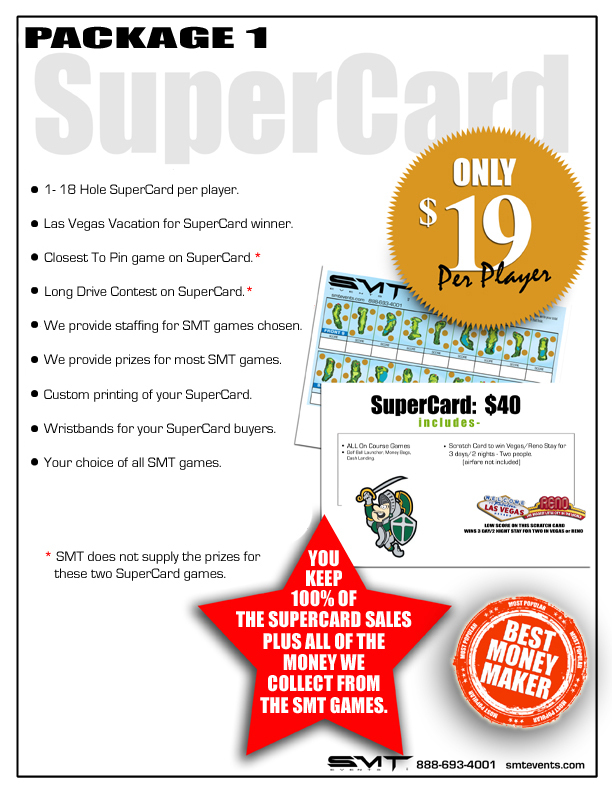 1 – 18 Hole SuperCard Scratch Card Game for every player in your event. We provide the staff to run all SMT games chosen. SMT provides the prizes for almost all of our games. Custom printing of your SuperCard. SMT provides wristbands to distinguish your SuperCard buyers. Your choice of all SMT games. We provide employees to run all of the SMT games that you choose. You keep 100% of the money that you raise from SuperCard sales, PLUS 100% of the money that we raise for you from the SMT games on the course! ALL THE MONEY IS YOURS~ This is your TOP moneymaker!! Don’t forget to sell the back of the SuperCard to sponsors!! WE ACTUALLY PAY YOU TO BE AT YOUR EVENT! !